Happy Retail Season, One and All! 👿 That’s right; retail season, not Christmas season – and, at this point, we’re deep in it, with only 17 shopping days left. So, forget about our nation’s domestic enemies’ war on Christmas; and too, accept that Christians lost that war before the Left ever engaged in it. Understand the true meaning of this holiday – spending, spending, spending. Think about it. 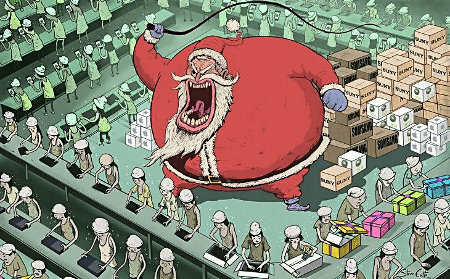 Christmas holiday sales comprise about 19% of the retail industries’ total sales in any given year, resulting a bit over 700 thousand “seasonal employees” being hired throughout the US to handle the holiday rush of consumers eager to the point of danger to buy stuff. And please, don’t forget that we have to buy the decorations too. It’s just not Christmas without a house full of decorations made by migrant laborers in a Chinese sweatshop. This entry was posted on Friday, December 7th, 2018 at 11:08 am and is filed under Society. You can leave a response, or trackback from your own site.